Random House Trade Paperbacks, 9780812977790, 256pp. Dreams are a recurring theme in the novel. What are Lillian's dreams, both literal and metaphorical? How do these illustrate or inform the larger subject of the American dream? Much of the novel centers around self-invention and reinvention. Can you identify some characters who invent themselves over the course of the novel? Which characters are successful? Which characters are unable to complete the process? According to folktales, "when you save the golden fish, the turbaned djinn, the talking cat, he is yours forever" (p. 43). Which characters in the novel are saved, in one way or another? Which characters do the saving? "Not that she is mine. That I am hers," Lillian says, describing her love for Sophie (p. 79). In many ways, love is the primary engine of the plot. How does love define, inspire, and compel characters in the novel? What are some of the things characters do for love? Do you think that love is portrayed in the novel as a wholly positive force? Contrast Yaakov's story with Lillian's. How do they each handle the loss of spouse and children, and how are they changed? Mythology–both the mythology of individuals and of cultures–is an important motivator in the novel. Which stories or beliefs drive different characters? How do established myths inform the journeys taken and the challenges faced by Lillian as she crosses the American continent? During Lillian's journey, there are key points at which she is required to demonstrate her allegiance as either a native or a foreigner, insider or outsider. Can you identify some of these moments? At the end of the novel, how complete is Lillian's assimilation? Relationships between family members, particularly parents and children, play an important role in the novel. Compare and contrast the relationships between Lillian and Sophie, Reuben and Meyer, Chinky and the Changs. What is distinct about each family? Are there similarities? How are sexuality and physical love portrayed in the novel? Consider Lillian's relationship with the Bursteins, Chinky's relationship with Mrs. Mortimer, and Gumdrop's relationship with Snooky Salt, as well as Lillian's relationship with John Bishop and Chinky's relationship with Cleveland Munson. What kind of person is Lillian? What do we learn, throughout the novel, about her passions and prejudices? Do you think Lillian is right when she says that she is lucky (p. 4)? The omniscient third-person narrator of the novel is able to jump forward and backward in time and between parallel narratives. What is the purpose of this technique? Why does the author want us to know what happened to Sophie, even though Lillian herself never learns? Do you think Lillian ever stopped looking for Sophie? The metaphors and descriptive images in this novel are unique. Can you point out a few effective metaphors that helped the novel come alive for you as a reader? What significance do the chapter titles have? What are they derived from, and what do they tell the reader about what happens in the novel? 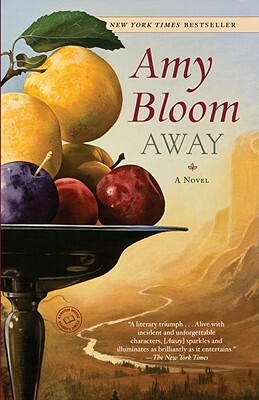 Why did Bloom title her novel Away?